We consider the unsplittable flow problem (UFP) and the closely related column-restricted packing integer programs (CPIPs). In UFP we are given an edge-capacitated graph G = (V,E) and k request pairs R 1, …, R k , where each R i consists of a source-destination pair (s i ,t i ), a demand d i and a weight w i . The goal is to find a maximum weight subset of requests that can be routed unsplittably in G. Most previous work on UFP has focused on the no-bottleneck case in which the maximum demand of the requests is at most the smallest edge capacity. Inspired by the recent work of Bansal et al. on UFP on a path without the above assumption, we consider UFP on paths as well as trees. We give a simple O(logn) approximation for UFP on trees when all weights are identical; this yields an O(log2 n) approximation for the weighted case. These are the first non-trivial approximations for UFP on trees. We develop an LP relaxation for UFP on paths that has an integrality gap of O(log2 n); previously there was no relaxation with o(n) gap. 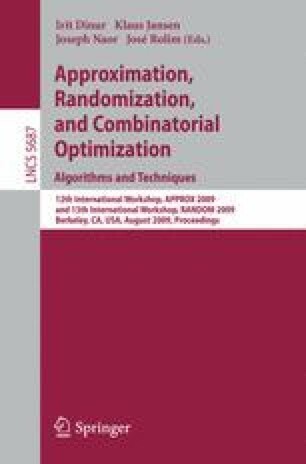 We also consider UFP in general graphs and CPIPs without the no-bottleneck assumption and obtain new and useful results.